Habitat for Humanity of Rutland County selects its first partner homebuyer Melissa Fournier (right) shown with her daughters. RUTLAND—Habitat for Humanity of Rutland County (HFHRC) is pleased to announce the selection of Melissa Fournier as its first Partner Homebuyer. Melissa Fournier grew up in the Rutland area and has worked at a local hotel for the last five years. She is the mother of two daughters, five and 13 years old. Living in a rental apartment in Rutland for nine years, Fournier faced overwhelming increases in rent. Habitat is currently rehabilitating a house on 30 West St. in Fair Haven. “There is still plenty of work to do to finish Melissa’s home. And we expect to start our next home in Rutland City in early 2017,” said Heintz. “We plan to finish this house in time for Melissa and her daughters to enjoy their first Thanksgiving in their new home,” he said. 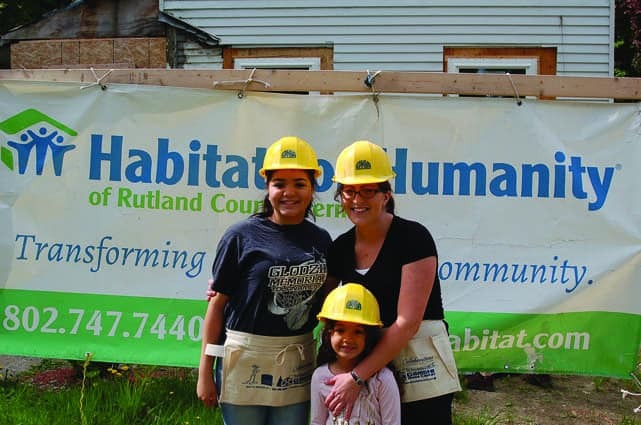 The Habitat for Humanity of Rutland County affiliate is dedicated to transforming people’s lives and the community by creating affordable and decent housing; lifting up one family at a time. Habitat was founded on the conviction that every woman, man and child should have a simple, decent, and affordable place to live in dignity and safety, and that ensuring access to decent shelter should be a matter of conscience and action for all. For more information or to get involved call the Habitat office at 802-747-7440 or visit www.RutlandHabitat.com. Editor’s note: Habitat for Humanity is a nonprofit Christian housing ministry that began in Georgia in 1968. While the partner families purchase the homes directly, Habitat makes no profit on the sales. Partner families must apply to the program and also must contribute sweat equity and work alongside Habitat volunteers. Houses may be built new or rehabilitated.